Many children and their families are now getting ready for the first day of school with great anticipation! A real milestone is right around the corner! Products like markers, folders and backpacks are more sought-after for school enrolment than for any other time! Are your customers especially looking for small trinkets for the schoolbag, thoughtful gifts for the siblings of abecedarians or a suitable present for the big day? No problem! Discover all the products in our School Enrolment theme world which are fun for amateur learners and are boosters for your turnover. 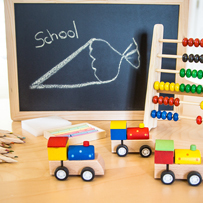 Is your assortment also perfectly prepared for this year’s school enrolment time? If not, we’re happy to help you!